Sometimes I like savory muffin recipes instead of sweet. These wonderful broccoli muffins with cheese and ham are perfect for a light lunch with salad or as a go-along with soups or stews. In a medium bowl combine the broccoli, ham, onion, parmesan and cheddar cheeses. In a larger bowl beat the eggs until they are foamy. Blend in the oil. Add flour, baking powder, oregano, parsley, thyme and garlic powder. Mix together, then stir in the broccoli and ham mixture and mix until just blended. Spoon muffins into 12 lightly greased muffin cups. Bake for 20 minutes until golden and a toothpick inserted in the center comes out clean. Makes 12 muffins. For vegetarian broccoli muffins, just leave out the ham. You can replace the broccoli with chopped asparagus as well. It is equally tasty. Eaten on their own, these muffins make a pretty healthy snack recipe too. If you chop the vegetables and ham finely, kids who don’t like them won’t even know they are in there. Make them even healthier by replacing at least half of the white flour with whole wheat flour. 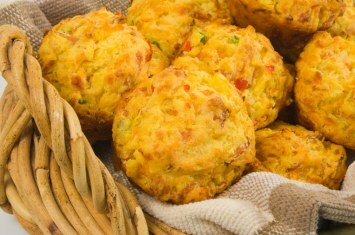 Savory muffins like these are very easy to make. Just make sure with any muffins you make that you don’t over mix the batter. Muffins are lighter and fluffier if they are mixed just enough to blend the ingredients together. They get tough with too much mixing. You will find the rest of our muffin recipes here. I just read the most mouth-watering recipe for broccoli muffins, but I don’t understand if by “lightly greased muffin cups”, you mean the paper ones or simply the muffin pan itself. Please help! I want to try these a.s.a.p.! Lightly grease the muffin tins.